Found this Jerry Street disc via eBay, and remembered the name from a 2010 blog post over at LoneStarStomp. 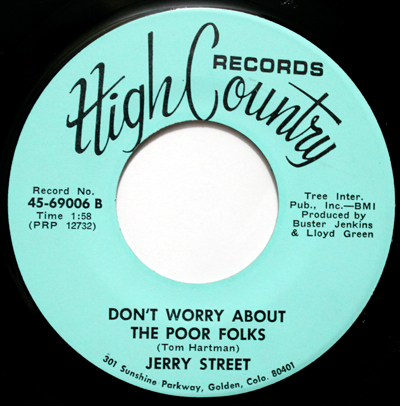 According to that post, it appears Jerry did quite a bit in New Mexico and Texas, but he must have headed north in his later career, as this find is on a Golden, Colorado label. 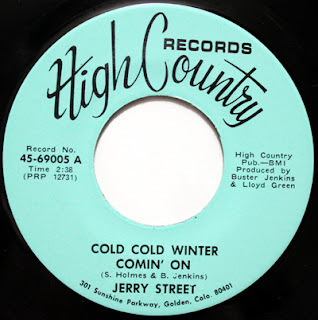 On this disc Jerry teams up with Lloyd Green, the steel guitar ace, who appeared on records for everyone from Johnny Cash and Charley Pride, to Sir Paul McCartney. Also of note is co-producer Buster Jenkins, who started out in Denver (on the Rocky Mountain Jamboree, and then later with his band the High Country Travelers). Buster also produced on the Band Box label before he started up the High Country label, in 1968 (producing Dewey Knight's "A Mind of Your Own," among others). There is one other High Country/Jerry Street collaboration that I know of. "The Same Old Thing" / "Listen They're Playing My Song" (High Country 70012).